The state of the workforce is a key component in our county’s overall economic health. It is a complex topic and must be viewed from various perspectives to fully understand. 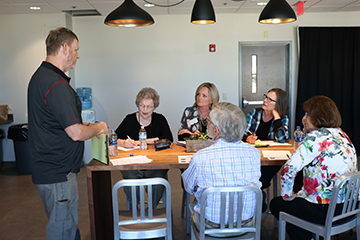 The League of Women Voters of Montgomery County and MCCF have partnered to begin Community Insights, a three part series focused on the Montgomery County workforce. This is a great way to engage in your community! We invite residents to come hear about the important issues, as well as ask questions and share thoughts. The series began on April 9 with "The Workforce: The Big Picture" with special presenters Cheryl Morphew (Montgomery County Economic Development) and Rick Hernandez (Crawfordsville/Montgomery County Chamber of Commerce.) Both provided a general overview of local business and employment data, as well as some trends to watch. Afterward, attendees were broken into small groups and given a few key questions to discuss. You can read a full summary of the session here. The series continues on Wednesday, April 17 with "The Workforce: The Human (resources) Perspective." A panel of local employers will be on hand to talk about the strengths and unique characteristics of our workforce, as well as the challenges they face and how they are addressing them. We will conclude with "The Workforce: Getting Schooled" on Tuesday, April 23. All sessions take place on the 4th Floor of Fusion 54 (101 W. Main Street, Crawfordsville) from 5:15- 6:45 p.m.